The cover is simple but effective. The image ties in nicely with the title and before I reach the blurb I know roughly what I can expect. Having worked in a conference and event department for many years, and briefly (very briefly) in the wedding department, I could relate to the ‘crazily ever after’ comment. The blurb is funny and gives me just enough information to draw me in and want to know more. I clicked through to the ‘look inside’ feature and read the first page. It starts well, and I did like Howe’s voice. I can see this being an amusing read to lighten the winter months. The Kindle price is £2.53. There is only 1 review on Amazon.co.uk (five stars), but 64 reviews on Amazon.com. 78% are five stars. From the first paragraph of this sweet book, I was snorting with laughter! The author really brings these colorful characters to life! I loved getting glimpses into all the weddings Tyler worked on, and found myself wondering how many of these couples found their happily ever after. My only complaint is that the sequel isn’t out yet! Give this book a read. You won’t be disappointed! N.B. : The sequel, Diary of a Wedding Planner in Love, is now out and also available on Amazon. 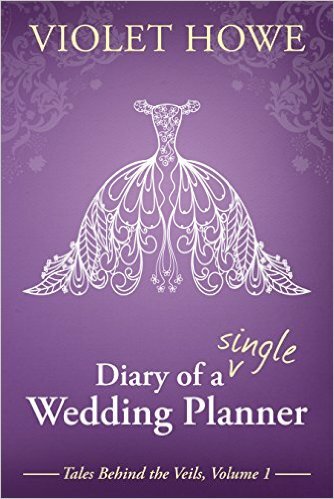 Diary of a Single Wedding Planner – buy your copy. No Friday Five from Rosie or Barb today but plenty of other posts to delight so pop over and see them. I love the purple and the lace on the cover, the title is intriguing too, I think it would be a buy from me.